On April 18th I was able to attend the Vera Bradley party! 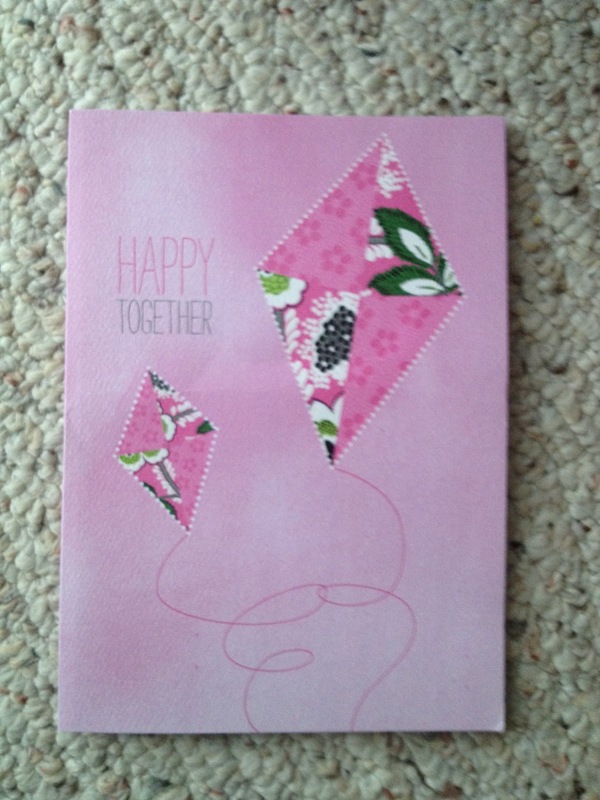 I was pretty excited when I got the invitation and found out some of my Vera friends would be there. It was a great chance to do some shopping and catch up with friends! 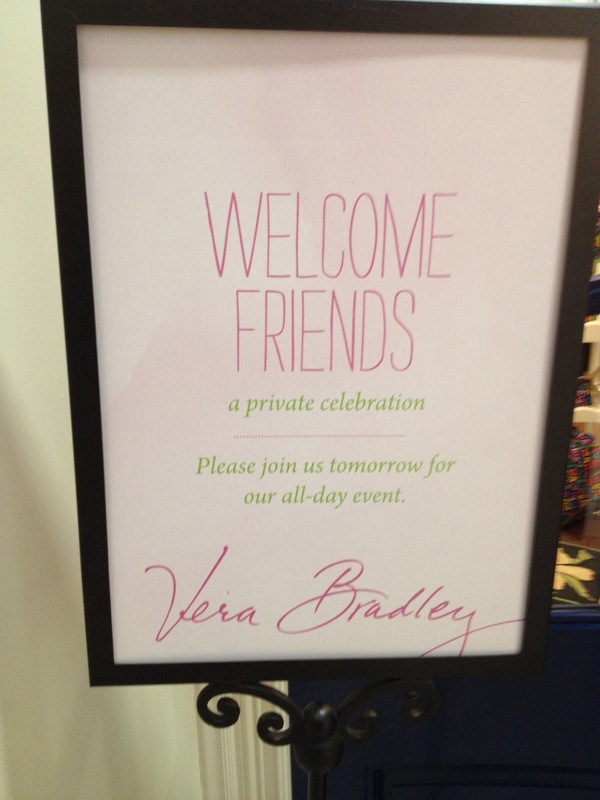 Sign outside of the Vera Bradley store. Kite marshmallow pops in white and milk chocolate! So sweet, they were good, but I loved the sugar cookies they used to have! My Vera friends, it was great catching up with everyone! Lisa won one of the raffle prizes: Hipster, Mini Hipster and the Mom and Daughter Apron set. 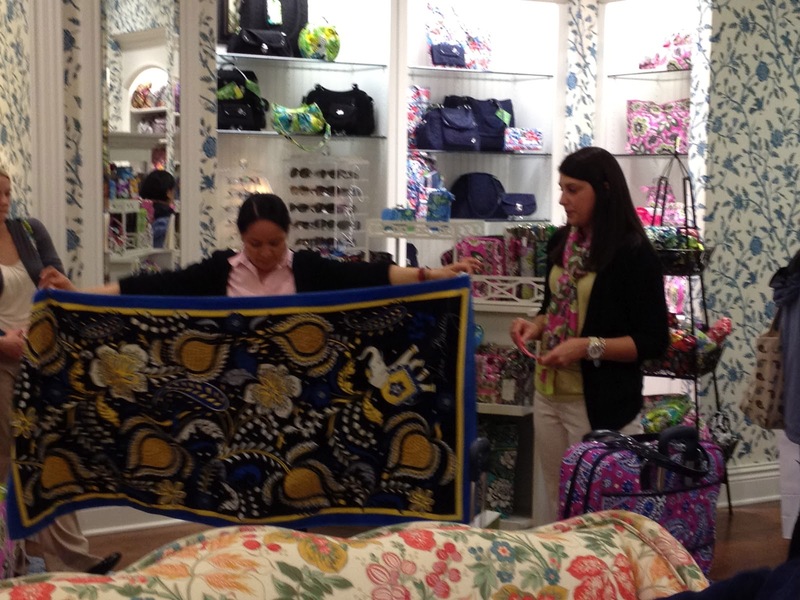 Before each raffle they would talk about some of the Vera Bradley products, here they were talking about the beach towels. I had a really great time and enjoyed shopping! There were two women from the home office (Ft. Wayne, IN) that were helping out during the party. They were both so friendly and helpful. One helped me and my friend Natalie look for a few bags and the other one tried to help me find a Book Keeper in Mocha Rouge, but then we figured out it was never made in that color...bummer! Everyone at the store made it such a wonderful shopping experience, so thank you! I made a list ahead of time so that I wouldn't buy too much. I did a great job sticking to my list...just one extra thing for me and one for my mom, otherwise it was on the list. Check back tomorrow to see what I picked up! 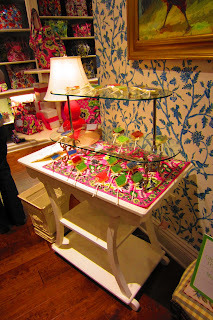 I went to the party at Roseville (which I know you've mentioned as a favorite store before). They are so awesome there. One of them actually took apart a raffle prize for the next day so I could have the last grand tote in lime's up! They are so awesome :-) I wish I'd stuck to my list better, but I ended up picking up a gift, so that was a good thing! I do love that store!!! They are always so sweet and helpful! 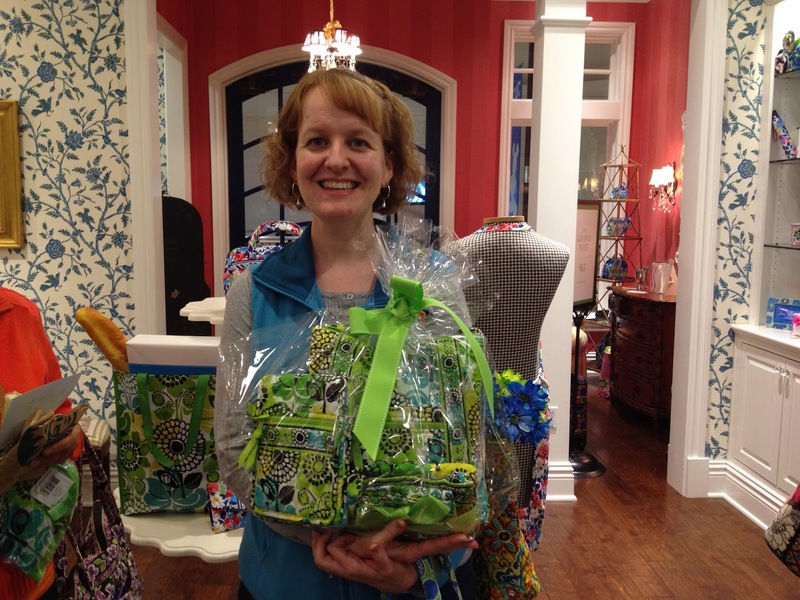 Glad you were able to get the last grand tote!! Thank you for all of the post you do , I really enjoy reading them !! I went to the Cincinnati. Signature store for the VIP . I got a Mandy and a new wallet in the new fall indigo pop. love it !!! I wonder when the preview for the winter line will hit the stores . There are some of the patterns in the survey , I really like . Thanks Julie!! I would guess the next preview would be in about 2 or 3 months...I never seem to know until they are happening. 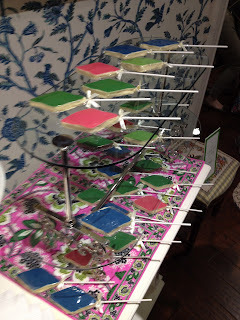 How do you get invited to such fabulous Vera events? So jealous, but at the same time it's great to see all the fun things Vera does for its customers and glad that you share all of your great purchase with us! 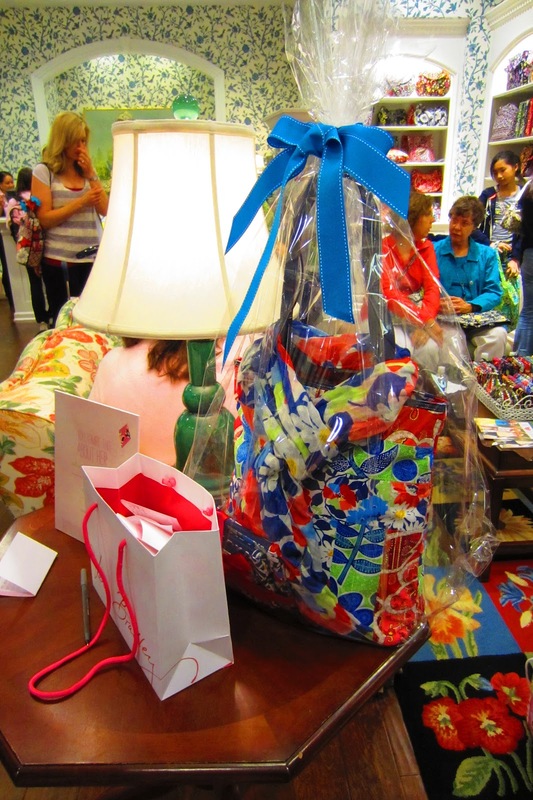 I know i shop at the Vera store pretty often in Bayshore, but never get the invite for the closed event. i would really love to go to one of those. Does shopping at a local gift shop that sells Vera count? I have 2 local gift shops that sell Vera Bradley and the closest Vera Bradley store is 2 hours away in another state. Oh, well, I will just enjoy the events from a far. Thanks for posting pics and for sharing. I really appreciate you showing us the new patterns and styles!! For what it is worth , I believe you are right Alison . 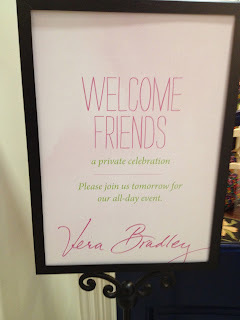 I actually called the Vera signature store here in Cincinnati and was told they pick their VIP invites by customers who are in their stores a lot and buy often . From what I gathered it is only the signature stores that were doing the VIP party. The retail stores who are separate often have their own sale or promotion from time to time . This was the first VIP I have been to and I am thankful for all the information always posted here !!! This looks like such a fun event! I've never seen the first raffle prize pattern before with the hot pink and neon yellow! I have got to have that, do you happen to know the name of the pattern?! Thanks!